Development of a technology for early detection and control of stock pests. Fungal infestation, bacteria and viruses – crop diseases begin long before harvesting - in the seedcorn itself! Till now, chemical agents have been used to prevent this but are expensive to buy and store. Increasingly restrictive EU insecticide and fungicide regulations and growing pathogen resistance also raise the financial and ecological price even higher. It is time for new solutions. 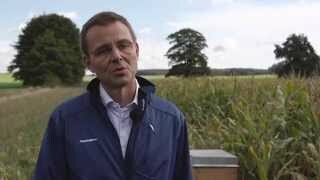 Interviewfilm about seed treatment with electrical power – the EVONTA e-3! Christian Gaisböck, seed specialist / Saatgutspezialist: Personally, I believe that in the future we will face far more strict regulations concerning the use of fungicides. In five or ten years, we'll no longer be allowed to use what we have today, simply because consumers won't accept it. I'm a fan of electron treatment and I hope that we'll be much better able to implement it in the field. Die modulare »e-3« Technologie für pestizidfreien Pflanzenschutz mit mikrobiologische Produktsicherheit Kategorie »Umweltfreundliche Technologien und Produktionsverfahren«. Mit der Verleihung des Umweltpreises werden herausragende Leistungen für den Schutz der Umwelt und der natürlichen Ressourcen sowie für den Naturschutz durch das Sächsische Staatsministerium für Umwelt und Landwirtschaft gewürdigt.